The nose is pretty light and shy, classic young mostly refill ex-bourbon style. Vanilla, apples, pears, a touch of malt, more vanilla (pudding), oranges, eucalyptus, white pepper and light green leaves. There’s also something in the background which I just can’t put my finger on (it’s industrial waxy-ish but not full-on wax…) and which I just recently encountered in a Deanston.Is this a Deanston? No idea, it does smell kinda Highland-ey… The palate is quite watered-down, but what’s there is… quite pleasant. Vanilla, still slightly sweet sparge water (for the homebrewers amongst the readers), green apples with bitter kernels, still slightly green walnuts, stale pepper, very diluted orange juice, after some time in the mouth with natural dilution by saliva more malt water and some cardboard appears. Also a young metallic note, this can’t be over five years old. The medium long finish is surprisingly dry with lots of green notes upon swallowing (ginger, draff) with vanilla, and some orange peel. A slightly bitter and yeasty note towards the end. 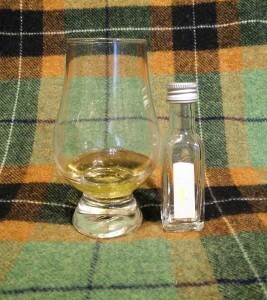 This is dram number one out of four mystery drams my brother challenged me to taste. Well, I guess the positive thing to say about it is it’s a nice drinker’s malt. A light, young, unobtrusive Highland style malt I’d have no trouble recommending for hot summer days with ice or tonic water (and ice) and a slice of lemon. Maybe for casual sipping on a budget too (I hope it’s cheap…), but it just does nothing for the discerning malthead. After being told which whisky it is: Well, I told you so, Deanston it is, I can never forget this very peculiar and indescribable note… Bought at an Austrian Supermarket chain under the “Glen Ardoch” brand, no age statement, for 15€. Well, that’s a fair price. Not really much more to add to that, other than that I’m glad they’ve put the distillery’s name on the bottle. come on u allready had a older blind Deanston recently,and u didn´t really like it why review this one? Besides, I write about everything I properly taste, just reviewing the best stuff isn’t fair.